We’ve got you covered for the days when your wavy hair won’t listen to you, and for the days it will. Also those days when you’re just feeling inspired. This low maintenance style is perfect when you’re in a rush and want to dress up your short hair. Step 1. Take two sections from your front left. Let’s call them Section A and B. Clip the rest of your hair away. Step 2. Take the section towards the back, B. Divide into half. Twist the halves and start intertwining them together, till you reach the end. secure with a hair elastic. Step 3. Release the rest of your hair. Lift the crown section, and pin Section B under it. 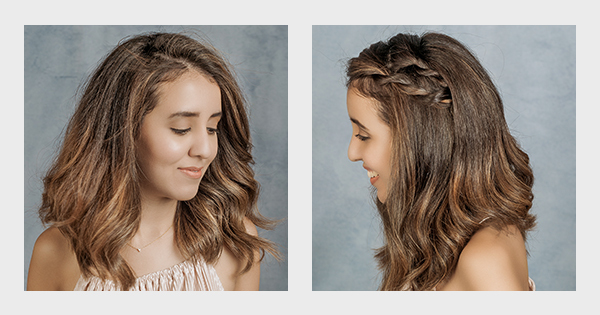 Arrange the rest of your hair over the ends of your braid to cover bobby pins and you are set!